Lemon | Become Healthy or Extinct! 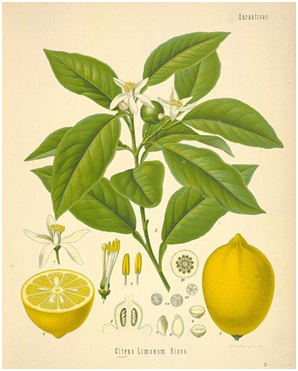 The lemon is a species of small evergreen tree native to Asia. The tree’s ellipsoidal yellow fruit is used for culinary and non-culinary purposes throughout the world, primarily for its juice, which has both culinary and cleaning uses. The pulp and rind (zest) are also used in cooking and baking. The juice of the lemon is about 5% to 6% citric acid, which gives a sour taste. The distinctive sour taste of lemon juice makes it a key ingredient in drinks and foods such as lemonade and lemon meringue pie. Lemons are a rich source of vitamin C, providing 64% of the Daily Value in a 100 g serving. Other essential nutrients, however, have insignificant content. Lemons contain numerous phytochemicals, including polyphenols and terpenes. As with other citrus fruits, they have significant concentrations of citric acid (about 47 g/l in juice). Lemon is an inexpensive, easily available citrus fruit, popular for its culinary and medicinal uses. It is used to prepare a variety of food recipes such as lemon cakes, lemon chicken and beverages like lemonade and lemon-flavored drinks. It is also used for garnishing. Lemon juice consists of about 5% citric acid that gives a tarty taste to lemon. Lemon is a rich source of vitamin C. It also contains vitamins like vitamin B, riboflavin and minerals like calcium, phosphorus, magnesium as well as proteins and carbohydrates. Lemon is generally consumed in the form of lemon juice or lemon water. Lemon water makes a healthy drink, especially when taken in the morning. Daily consumption of lemon water provides a number of health benefits. It is used in marinades for fish, where its acid neutralizes amines in fish by converting them into nonvolatile ammonium salts, and meat, where the acid partially hydrolyzes tough collagen fibers, tenderizing the meat, but the low pH denatures the proteins, causing them to dry out when cooked. Lemon juice is also used as a short-term preservative on certain foods that tend to oxidize and turn brown after being sliced (enzymatic browning), such as apples, bananas, and avocados, where its acid denatures the enzymes. Lemon juice and rind are used to make marmalade and lemon liqueur. Lemon slices and lemon rind are used as a garnish for food and drinks. Lemon zest, the grated outer rind of the fruit, is used to add flavor to baked goods, puddings, rice, and other dishes. Lemon can help relieve many digestion problems when mixed with hot water. These include nausea, heartburn and parasites. Due to the digestive qualities of lemon juice, symptoms of indigestion such as heartburn, bloating and belching are relieved. By drinking lemon juice regularly, the bowels are aided in eliminating waste more efficiently. Lemon acts as a blood purifier and as a cleansing agent. The intake of lemon juice can cure constipation. It is even known to help relieve hiccups when consumed as a juice. Lemon juice acts as a liver tonic and helps you digest your food by helping your liver produce more bile. It decreases the amount of phlegm produced by your body. It is also thought to help dissolve gallstones. Lemon, being a natural antiseptic medicine, can participate to cure problems related to skin. Lemon is a vitamin C rich citrus fruit that enhances your beauty, by rejuvenating skin from within and thus bringing a glow on your face. Daily consumption of lemon water can make a huge difference in the appearance of your skin. It acts as an anti-aging remedy and can remove wrinkles and blackheads. Lemon water if applied on the areas of burns can fade the scars. As lemon is a cooling agent, it reduces the burning sensation on the skin. Lemon water is used in dental care also. If fresh lemon juice is applied on the areas of toothache, it can assist in getting rid of the pain. The massages of lemon juice on gums can stop gum bleeding. It gives relief from bad smell and other problems related to gums. Lemon is an excellent fruit that aids in fighting problems related to throat infections, sore throat and tonsillitis as it has an antibacterial property. For sore throat, dilute one-half lemon juice with one-half water and gargle frequently. One of the major health benefits of drinking lemon water is that it paves way for losing weight faster, thus acting as a great weight loss remedy. If a person takes lemon juice mixed with lukewarm water and honey, it can reduce the body weight as well. Lemon water works wonders for people having heart problem, owing to its high potassium content. It controls high blood pressure, dizziness, nausea as well as provides relaxation to mind and body. It also reduces mental stress and depression. Lemon water assists in curing respiratory problems, along with breathing problems and revives a person suffering from asthma. Lemon is also a diuretic and hence lemon water can treat rheumatism and arthritis. It helps to flush out bacteria and toxins out of the body.